(September 17):The Education Ministry must go beyond a mere review of operating procedures of national school examinations and zero in on the many ways leaks of test papers can happen in Malaysia, an education lobby group said. The definition of a leak must be widened and what constitutes a leak must also be specified, the Parent Action Group for Education (PAGE) said. The group urged the ministry to take these repeated episodes seriously following leaks in the recent English and Science papers of the UPSR examination which involved nearly 500,000 Standard Six students this year. PAGE chairperson Datin Noor Azimah Abdul Rahim pointed out that there have been numerous claims of leaks in the past but no action had been taken as the ministry did not consider those instances as actual leaks. "We have heard this for the past few years but no one has been punished. The ministry's definition of what constitutes a leak is very narrow," she told The Malaysian Insider. "You have to be in possession of the actual examination paper... that's only when the ministry takes it as a leak." A photocopy of the examination paper, however, is not a leak, according to the Education Ministry, claimed Noor Azimah. PAGE chairperson Datin Noor Azimah Abdul Rahim says the Education Ministry's definition of a leak is too narrow. – The Malaysian Insider file pic, September 17, 2014.PAGE chairperson Datin Noor Azimah Abdul Rahim says the Education Ministry's definition of a leak is too narrow. – The Malaysian Insider file pic, September 17, 2014. "It is also not a leak if the questions are hand-written on another paper. And also if it is retyped with different font size, it is not a leak," she said. "This definition of a leak by the ministry is so tight and hard to define that people get away with doing these things." The culprits, she said, have learnt to test and work around the system to leak examination papers. "In fact, last year when someone was investigated for leaking the SPM examination papers, we were all so sure that he would get charged. But he got away with it." Noor Azimah was referring to a report made last year after questions from the Mathematics and Additional Mathematics papers in the Sijil Pelajaran Malaysia were allegedly leaked in a seminar. But police later rubbished the claims, saying that the questions were only forecast ones. In the latest incident involving the UPSR, or national primary school examination, the Science papers 018, 028 and 038, scheduled for last Thursday, were postponed following a leak the day before. Then, on Thursday, the UPSR English papers 014/1 and 014/2 were also found to have been leaked, causing public outrage as the students had already sat for the papers on the same morning. The resit for the Science and English papers will now be on September 30. The Education Ministry has also set up a nine-member independent panel, headed by former chief justice Tun Zaki Tun Azmi, to review the Malaysian Examinations Syndicate's standard operating procedures for public examinations. Police have launched investigations into the leaks under the Official Secrets Act, questioning a total of 12 people so far. Seven people have been arrested as of yesterday, including a Penang primary school headmaster, an insurance agent and an engineer. The others are teachers. Noor Azimah said the ministry was forced to take action following the spread of a picture showing the examination papers through messaging service WhatsApp. "The picture that was spread around actually had the words 'Lembaga Peperiksaan Malaysia' on it so that was as good as having the actual paper," she said. "They couldn't just ignore this. And there was also the public outcry that the ministry had to do something." The educationist said the ministry should now work to redefine its description of leaks as irresponsible parties would work around the loopholes if nothing was done about it. "So next year, someone will take a picture of the question paper without the words 'Lembaga Peperiksaan Malaysia' and that would be all right? Or retype it with different font type and size? "The ministry has to anticipate a leak at every step in the process and do what is necessary to prevent such an incident from happening," Noor Azimah said. She also agreed with Public Accounts Committee (PAC) chairman Datuk Nur Jazlan Mohamed who called on the Auditor-General to conduct an investigation on the Examinations Syndicate following the leaks. "The A-G should step in to do a proper audit of the process to ensure that security of the exam papers is not compromised," she said. 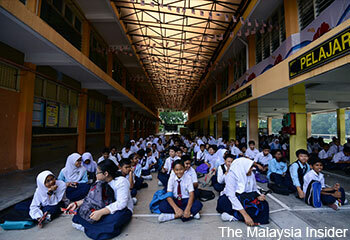 The leaks, considered one of the most serious in years, affect some half-a-million Year 6 pupils who were to have ended their UPSR examination last Thursday. Education Minister I and II, Tan Sri Muhyiddin Yassin and Datuk Seri Idris Jusoh respectively, have also apologised to parents and pupils, while opposition lawmakers are demanding that heads must roll over such serious breaches. The Examinations Syndicate director Dr Na'imah Ishak and her deputy (operations) Dr Wan Ilias Wan Salleh have also been suspended.